Nairobi Elephant Orphanage and Ithumba are our first stops in Kenya before we go to the Masai Mara and Lake Nakuru. We sponsor two babies, Kandecha and Ngasha from the orphanage and this is the reason we first plan our trip to Kenya. 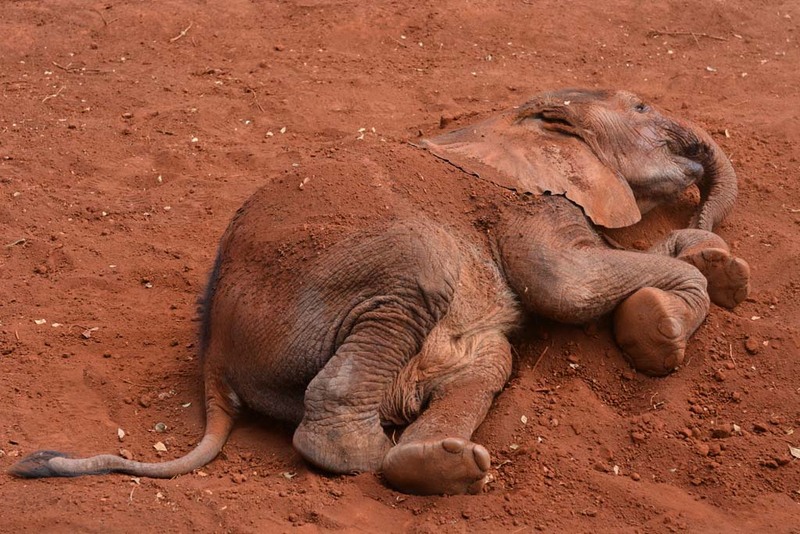 The David Sheldrick Wildlife Trust owns the nursery where they care and rehabilitate the baby orphans so they have a chance of living a life in the wild. 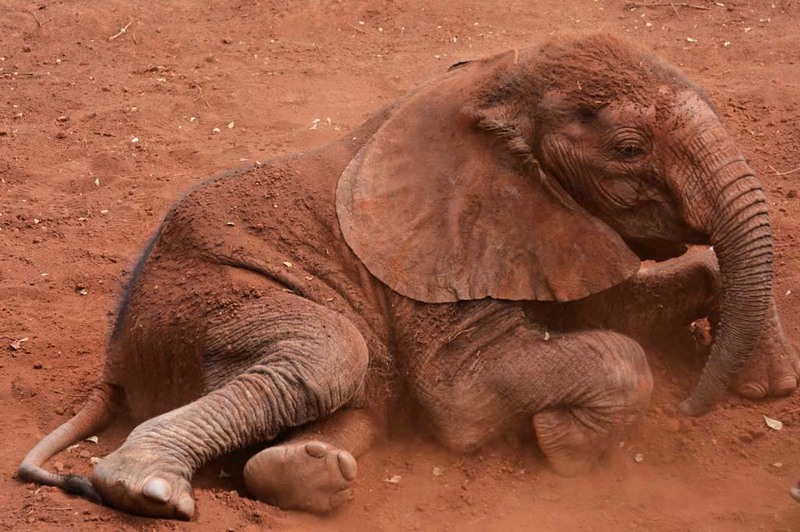 Elephants in Kenya are orphaned mainly because of poaching, human conflict and falling down wells. The babies need highly specialised intensive care. 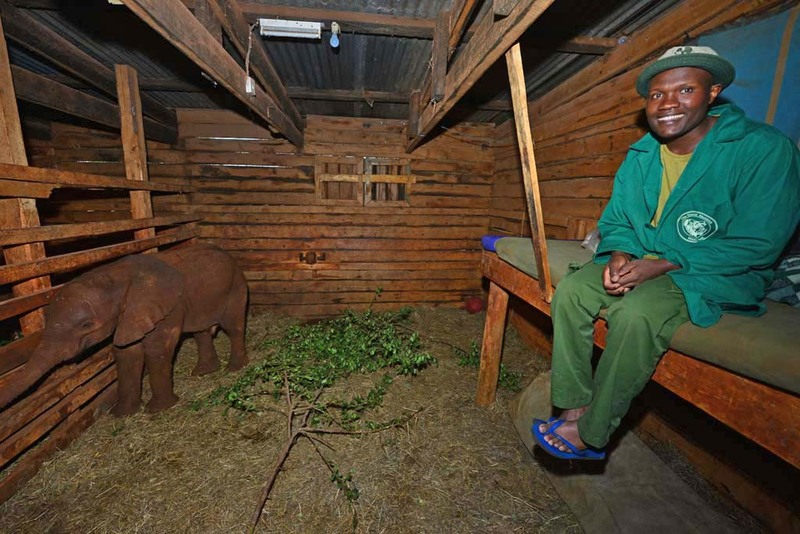 The keepers are surrogate mothers and spend 24 hours a day with the orphans, even sleeping with them. The young babies need feeding every 2-3 hours and it is essential they are kept warm and have company. This all involves huge dedication, devotion and lots of money. The orphans stay here at the nursery until they are ready to transfer to the trust’s release sites at Ithumba or Voi in Tsavo National Park. This is when they are about five years old but varies for each individual. Some will need more time before they are ready for the next stage of their rehabilitation. 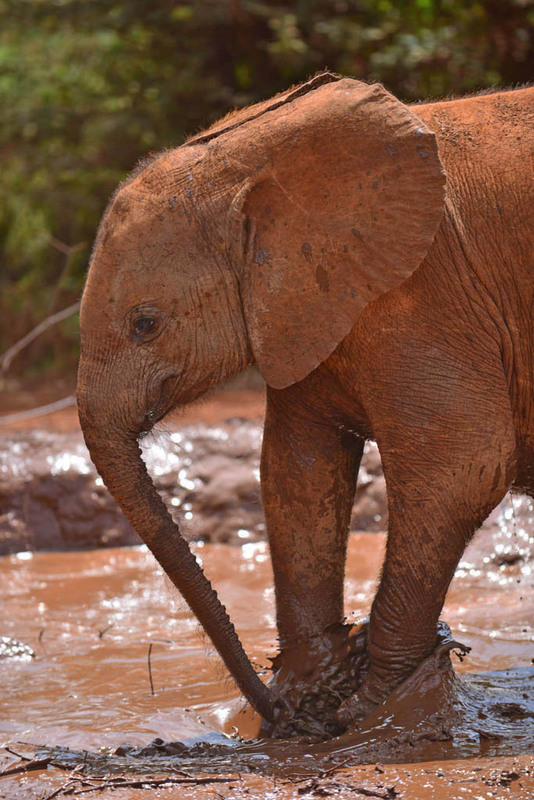 Ngasha and the others love to play in the red dirt and throw it all over themselves. Now three years old, he arrived at the nursery in 2012. When only seven months old, the tiny baby caused a commotion when found disorientated and frightened while wandering a town. Thankfully the townspeople reported him and he was saved by the trust. 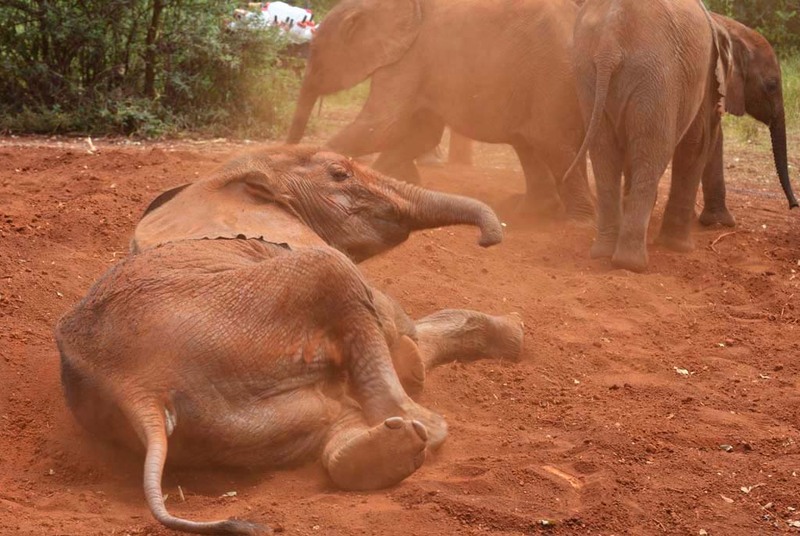 Kandecha our other sponsored elephant is now five years old and has left the nursery to begin the next stage of his rehabilitation with other orphans of similar size at Ithumba. Wait for me! It’s milk bottle time. 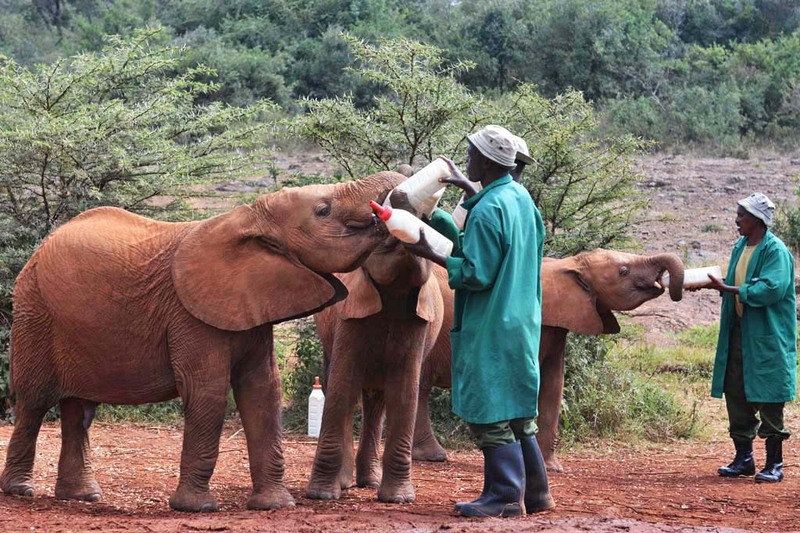 Nairobi Elephant Orphanage is open at 11 am to the public for an hour. 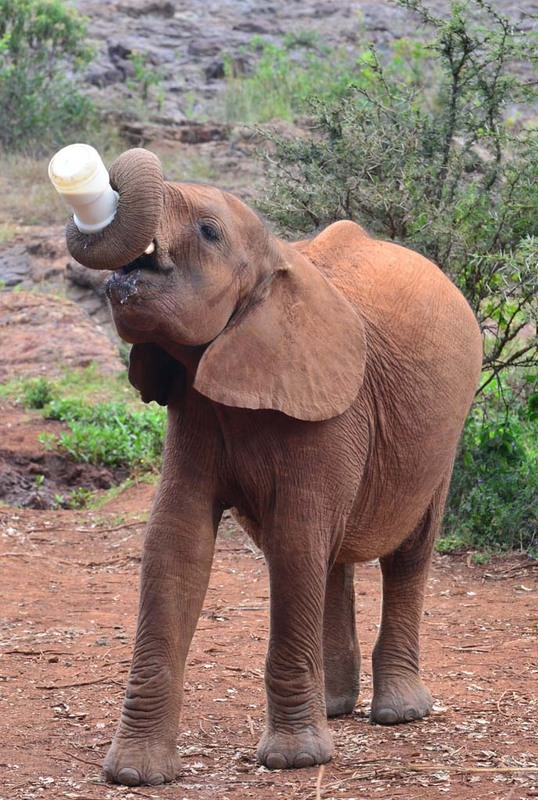 They drink their giant bottles of milk, play in the dirt and interact with their keepers and each other. Exuberance and excitement fill the air and the babies have so much fun. We stand behind the ropes but sometimes babies come close and feel us with their little trunks! For just $50 a year you can adopt an orphan and the money goes directly to the project. Sponsors receive an adoption certificate, regular updates by email and a watercolour painting of the adopted elephant. You can make a difference in the plight of these babies. Drinking the milk bottle all on his own! Sponsors of babies can arrange a special night visit between 5 pm and 6 pm to see the babies put to bed for the night. The babies each have an individual stable they share with their keeper. Being a keeper must be one of the most special jobs in the world! Kennedy Mulu and baby Sokotei get ready for bed. The keepers spend 24 hours a day with the babies. The entrance fee is 500 Kenyan Shillings (about $6.00). If you have a tour or safari booked through an operator just ask them to include this with your tour or you can get a taxi. They have so much fun. Playing in the mud is pure bliss. Absoulutely fantastic as usual makes one wish they were there. Thanks Noela. It was a fantastic experience. Amazing photography well done thanks for sharing, this experience is on my wish list. It certainly is an experience of a lifetime Sue. Thanks for your comment. Such beautiful images. They really show how happy these babies are. Thank you for highlighting this wonderful organisation. If I am lucky enough to visit Kenya it is definitely a place I would visit. 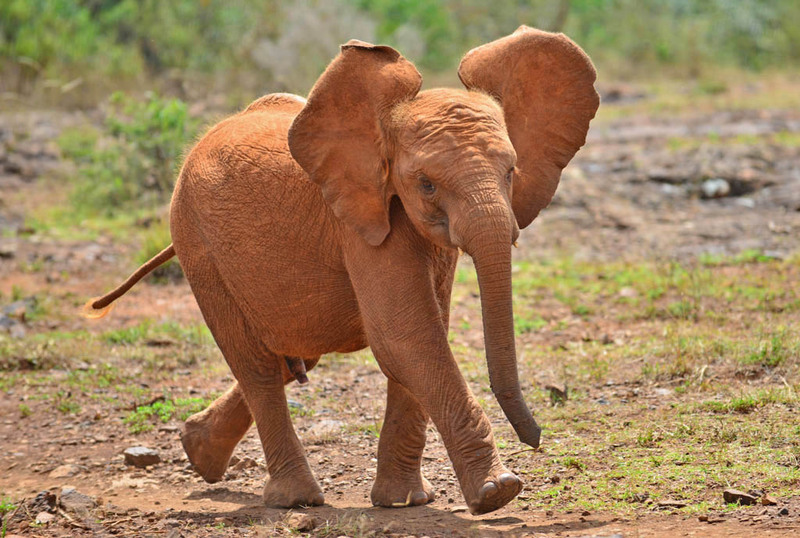 You have inspired me to sign up to sponsor a baby elephant. Cheers and thanks! Awesome photos, such beautiful babies, thank you for sharing, the keepers have an amazing job! We agree the keepers have an amazing job! Thanks Leonie. Thanks Katrina. We are glad we have inspired you, as it is a wonderful organisation and a great cause. It makes you wonder what would happen to all the baby Elephants without them. Wonderful stuff! You highlight the plight of animals so intimately. No one could doubt you two are equal to the calibre of those carers and they are special indeed! Money donations would certainly help, but only love could compensate them for giving up their lives to be on call to (any) baby 24/7! And who knew elephants needed milk for so many years? 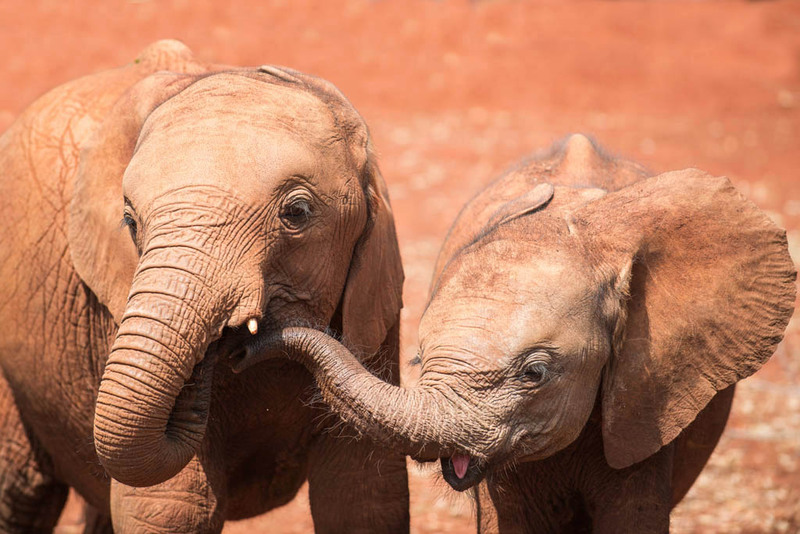 If it’s true that ‘an elephant never forgets’ isn’t it something that at least these babes will know that not all humans are like the beasts who hunt their parents for sport! Awesome! Thanks Marie for following our blogs and your comments! It really is an amazing organisation and everyone involved works tirelessly for the welfare of the little Elephants. It was an amazing experience to see them. Thank you for reminding me what a fantastic time I had at the orphanage! it is definitely a must see. If you go and want to see the littlest baby’s for the noon mudbath — arrive early so you can go to the far end where the blankets are. In order to fully experience the magic of the elephant orphanage, it’s totally worth it to foster a baby elephant. That way you are able to go back and see them at night for their feeding. A magical experience to see these little angels! orphan(s) is just the best experience of your life. Amazing photos of this truly once-in-a-lifetime experience! Julie thanks for your comments and hints. The night time visit is really special.We remember seeing photos of the keepers putting the babies to bed at night and we couldn’t believe it. Seeing it for real doesn’t make it any less amazing. 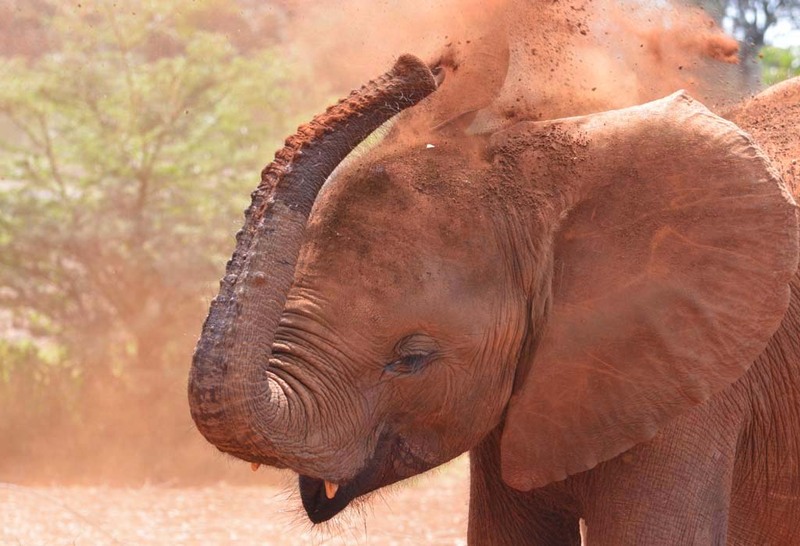 You are pretty amazing yourself to sponsor 9 Elephants!! Hi Shai-lea thanks so much for your inspiring comments! It makes our day to recieve messages like yours. Please contact us if you have any questions and thanks for reading our blogs.